The tour schedule for inspections is available from the US office in March of the current year. 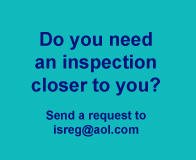 You'll also find it on the web in the INSPECTIONS section. 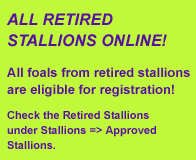 All participants must contact the evaluation host in advance about the number of horses (stallions, mares, foals) they will bring along as well as about stabling needed, directions and other local information, or starting times. Due to the increase of the number of horses we require advanced enrollment. Please retrieve the enrollment form and mail or fax it to the relevant host. All participants should check in with the evaluation host, upon arrival at the site. For some sites the number of horses might be limited due to limited room, parking etc. Participants should be on the grounds and ready to show at the starting time indicated by the host but should arrive approx. One hour before to have some extra time for check in. Time of evaluation can be subject to change due to the unpredictable nature of airlines and ground transportation for the judges. Mares don't get branded at the inspection for any of the books. DO NOT leave the grounds until you have completed all paperwork. Retrieve your original papers, pick up score sheets and pay your fees. Please, keep always in mind and honor that all hosts voluntarily set up their inspections and spend a lot of time and money to make it work!